5151 p., 13,5 x 20,8 cm. J. W. Ueberfeld, the unnamed editor of this edition, and his co-workers came close to reaching the current goals of a scholarly edition even at that time. They strove to provide the texts in accordance with the original manuscripts, and their edition contains the »changes made in the present and in previous editions« in an index which corresponds to an historical-critical apparatus. The reprint of the 1730 edition and the ›Urschriften‹ (Original Writings) are both valuable in their own way and complement each other. 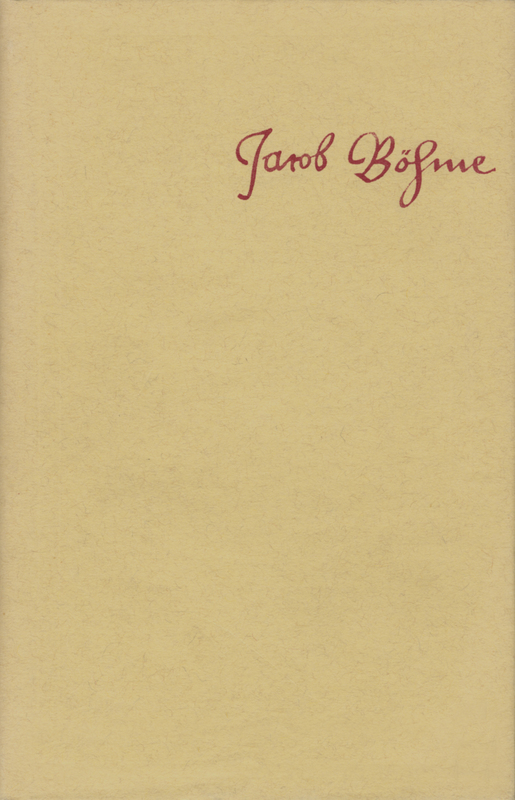 In addition, the reprint contains the more attractive plates from the 1682 edition and Peuckert’s ›Das Leben Jacob Böhmes‹ (The Life of Jacob Böhme) in a second, enlarged edition. Die Urteile aller Kenner der vorliegenden Ausgabe stimmen darin überein, daß sie an Vollständigkeit und Genauigkeit sowohl die früheren als auch die späteren übertrifft. Sie ist bis heute die maßgebliche Gesamtausgabe.